Winter is definitely comfort food time. Our cook book of the week, Winter on the Farm: Heartwarming Food for Colder Months, is filled with delicious, hearty, comfort food, a real gem. Our recipe of the week, pasta with sausage and cheese, is a hearty meal that is quick and easy to make. If you’re looking at a fun day’s outing with or without the kids, then come visit Wickedfood Earth at the Cambridge Food Festival, where we will be selling a wide variety of delicious homemade produce, see below for details. And as ever, we have a wide selection of cooking classes for the next few weeks, see our programme for June and July. Sunday 16 June at 4pm – Jamie’s Italy (R430pp). Sample the flavours of 8 dishes from Jamie Oliver’s road trip through Italy’s culinary landscape. These authentic recipes learned in this Italian cooking class are practical for foreigners, and the instructions easy to understand. Dishes include brushette, risotto, grilled mushrooms, baked creamy chicken and spaghetti pie, grilled fish, fried courgettes, caprese salad, and fresh fruit and almond tart. Monday 24 June at 6pm – Classic Portuguese dishes (R430pp). At the heart of Portuguese cuisine is the use of quality ingredients prepared simply to preserve their distinctive flavours. Portuguese food is renowned for being lusty and robust. Because Portuguese cuisine is easy to prepare, and uses very basic equipment, it is often described as peasant food. The use of seasoned pork, strong olive oil, garlic and onions contributes to the image of strongly flavoured, simple cooking. This is Sunday dinner fare designed to satisfy the appetite and reinforce the bonds of home and family. Dishes in this Portuguese cooking class include pickled tuna, chickpea soup, grilled chicken and molotov pudding. Sunday 30 June at 4pm –Sweet treats – the art of baking (R430pp). Baking holds a certain mystique and is often associated with disastrous stories. Unlike most areas of cooking where just a basic knowledge of food science is sufficient, baking requires a broader understanding of food chemistry and how and why dessert recipes work. Successful dessert making requires precision, patience, and strong attention span. Join us in our baking cooking class, for an introduction into baking which includes cupcakes, Black Forest chocolate cake, cheesecake, crunchies and quiche. Monday 01 July at 6pm – Mexican flavours (R430pp). The history of traditional Mexican food is a long and complex one, and every bit of the complexity is reflected in the sheer variety of flavours in Mexican cuisine. Present day Mexican cuisine has evolved into something truly extraordinary. Join us in this Mexican cooking class as we blend the exotic flavours with that of the new world flavours which includes melted cheese with mushrooms, coriander soup, lamb in a chilli sauce, and rice pudding. This coming Saturday, 8 June, sees Wickedfood Earth selling a wide variety of delicious homemade produce, from pulled pork and smoked chicken mayonnaise filled rolls, to a wide variety of jams, preserves and chutneys, and a selection of frozen pork cuts and artisanal sausages. When: Saturday 8 June from 9am to 5pm. Where: Cambridge Food Festival, at Mountain Cambridge School, Beethoven Street, Hartbeespoort Dam. Winter is a time for hearty stews, thick soups, belly filling pasta and chocolate desserts. 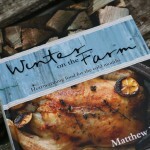 Our cookbook for this week whisks you away to chilly winter days in the country, exploring country cooking at it’s best. … Click here to read more. Pasta is a fantastic ingredient, light and summary, or rich and comforting, it all depends on the sauce. Our recipe for this week is a perfect quick winter dish. …. Click Here for all our recipes.